Beer and bikes don't usually go well together, whatever some people might think. 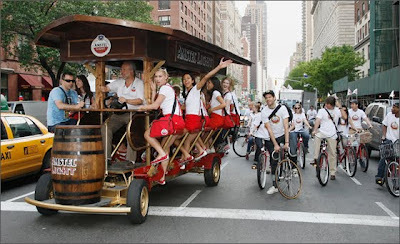 Now the Dutch have come up with a solution to those wanting to drink and ride, the beer bike. You and 21 bicycle/beer-loving friends can now imbibe whilst touring Amsterdam under your own steam - with the added benefit of burning off some of those beer carbs! Inevitably there have already been complaints about drunken stag and hen do's, as well as reports of three accidents.